Change graph color permanently - The fluorescence laboratory. This tutorial will set spectrum colors permanently. If instead the color is set using edit-mode colors will change back to their originals when the plot is updated. In this example, the Cy3 and Cy5 spectra were imported into a|e using the download reference spectra functionality. 1. Press the 'Set permanent graph color' button in the toolbar. This will open a selection dialog box. 2. Select the spectra you wish to change to color of. Press down the Alt or Shift key for multiselection. 3. 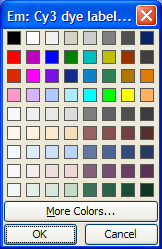 When pressing OK this will open a color dialog box for each chosen spectrum. Select the color and press OK.